Last week we had to buy honey. Next week, we will run out of potatoes. Last summer’s onion harvest was non-existent. And, in the late fall, I didn’t realize that our new raised beds would freeze earlier than if things had been traditionally planted, in the ground. Fully half of the carrots and beets were solidly frozen in place. We are too new at this to know whether they can be salvaged when the bed thaws. Were we really homesteading, any one of these errors could have spelled a hungry winter. The honey shortfall isn’t as grim as it sounds. Unlike most, we are spring harvesters. We leave the honey in the hive for the overwintering bees. Spring is the best time to determine what was “extra.” The only downside of our harvest timing, is that we have to watch that we get there, before the spring-cranky bears do. To cover our shortage we bought honey from our local co-op, produced by a guy we know. There’s cheaper honey out there–but you have to wonder. Honey is one of the most adulterated, and frequently counterfeited, agricultural products. Often, what you get in the stores is mixed with high fructose corn syrup. I’d rather buy from a guy I know and trust. We’ll get better over time. We’ll improve our sorry soils and we’ll learn the ins and outs of our season. Our fruit trees will mature and provide a larger yield. We plan to make a solar dehydrator, but with a grand total of 41 apples–most of which we scarfed up as soon as they were ripe–that may be premature. Between dehydrating, freezing, root-cellaring and canning, in a couple of years, we’ll make it through the winter without so many trips to town. In the meantime, the bulk of our food is still store bought. Store bought. The impact of that expression has shifted throughout my life. When we were kids and my mother was stretching each dollar, she baked all our bread and goodies. We picked berries and canned all of our jam, apple sauce and winter fruit. Wouldn’t you know that, in the face of fresh baked and homemade, there was a part of us that longed for Oreos and Wonderbread…like the other kids had. We wanted store bought. My older sisters made all of their clothing–beautifully and impeccably tailored. (I didn’t share that particular talent.) Their primary objective was to make something so perfect that others would not know that it was hand-made. Their skills turned baby-sitting money into fashion. We all learned to knit, and crochet. These were basic, life-skills. My mother was a gifted and prize-winning potter. She made all of our dishes. I remember wishing that those plates would stack neatly in the cupboard, like at other people’s homes. And, again to be frugal, my father learned woodworking and built all of our furniture. It was simple and elegant. Or, we bought “rescue antiques” and refinished them back to their former glory. Our home looked nothing like the store bought stuff in our friends’ homes. I’m sure we didn’t fully appreciate it then, that we enjoyed an aesthetic unavailable in the “normal” world. Our family hung with odd people, artists and weavers, potters and do-it-yourselfers. Even when surrounded by all that talent, to us kids back then, there was still an appeal to the quick and easy consumerism we saw around us. And I’ve spent my entire adult life working my way back to the basic, and frugal elegance our family enjoyed when I was a kid. I’m still rescuing antiques and materials. Rick and I built this house to our own tastes and use. I don’t know if others would see, or appreciate, the things in which we take satisfaction. You see, I have abandoned the quest for store bought. It’s almost as though those guests, after a lovely visit, had their car break down in the driveway on their way out. Back in, they lumber–hauling in their baggage. And then the wait–after everything worth saying was already said in the visit-in-chief. Winter has returned. Just when I was about to start cleaning up the garden. Just when I was about to start digging, and prepping, the holes for the hundred or so trees I’ve ordered. Spring has a short window when the big eyes of winter have been ordering from the nurseries. We went off for a visit “up north” for Easter and when we came back, winter followed us home. Now, with a fresh coat of eight inches of white on the landscape and a polar vortex at the door, I’m having to re-think my Spring schedule. It’s not that I don’t like winter. I revel in it. It’s beautiful. I don’t mind the cold and I don’t even mind shoveling snow. But, everything has its time, and it’s time for Winter to move along. Once again, it’s that unstable-climate-change-thing to blame. Erratic warm temperatures in the arctic have destabilized the jet stream again, sending frigid air down to invade our Spring. It’s supposed to hit Washington D.C. hard. Maybe a dose of sub-zero in April is just the ticket to wake up all those politicos. How’s that for your cherry festival, eh? It won’t disrupt our cherries, or most anything else. Our orchards hadn’t yet made strides into Spring. The ground is still frozen–and will be, now, for another couple of weeks. (Though, I’m sure the cherry farmers will find cause to whine.) It’s time to count our blessings. We’ll just throw another log on the fire and revise our plans. I just hope things thaw by mid-April, when my five score trees are scheduled to arrive. What kind of fruit do you want, and why do you want it? It’s probably not good to save this decision for the time when, cart full of other stuff, you’re standing in the gardening department at the big-box store, squinting at the little, fruit description labels tethered to spindly saplings in tubs. What kind of fruit do you like? What do you eat now? Don’t fixate (yet) on any specific cultivar (tree variety.) Just figure generally what you’d like. Then you can work on specifics and, more importantly, the realities. If you don’t eat fruit now, what makes you think that, three years from now, if this poor tree survives, you’ll want to eat its fruit then? Let’s throw some other factors into the mix. 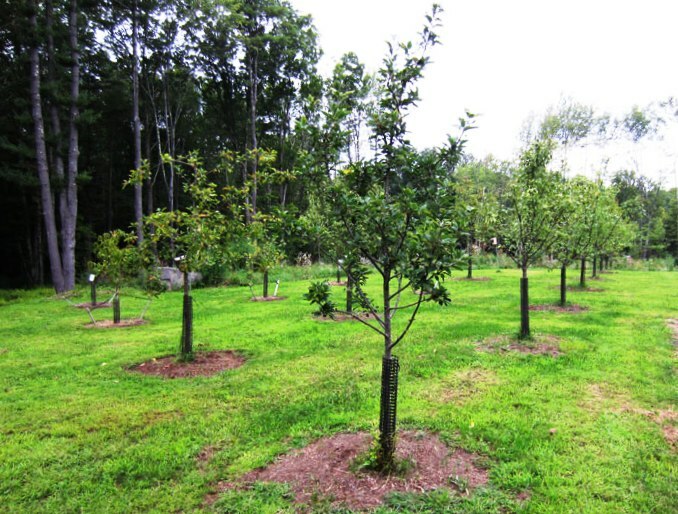 How much land do you have for fruit trees? (As a general rule-of-thumb, you’ll need to have an area around each tree that is as big as the tree will be tall. And no, you cannot overlap the root space for trees.) Do you have good light? What kind of soil do you have? Are you on a slope—and if so, top or bottom of the slope? (For air movement.) Are you planting in a space where you can water (or are you depending on rain?) Can the tree survive in this area? This is the big one. Where do you live? Start here. Find your state and click on it. (My deepest apologies to my non-American readers, but your location will have similar information available.) Yes, the garden department at the big-box store will sell you a banana tree, but should you buy one? Figure out what climate zone you’re in and start from there. (Californians may prefer to use the more detailed microclimate Sunset Magazine zones.) Your temperature range is the single biggest factor in tree choice success. Armed with that, you could go online to find a fruit cultivar that will live in your location. But wait, there’s more. Go online, armed with your zone and your fruit type, and you’ll find dozens of candidates. Maybe you want an apple that was your favorite as a kid? Maybe an all-around workhorse apple? How will you be using it? There are fruit that are bred for “eating” or market purposes, there are baking and culinary fruit and there are canning fruit. You might be considering drying it. Well, the same apple you use for lunches might not be the one for pie, and not the one for sauce. Especially, if you’re dealing with limited space, you’ll need to make some compromises and choices. In your selection, make sure you check whether your choice is self-pollinating, or whether you’ll require a companion variety in order to get fruit. Nurseries aren’t very good about warning you about this. (Even my own Mum planted a lovely, exotic French Gage plum, which has never given fruit because it’s not self-fertile and it doesn’t have a compatible pollinating partner.) The catalogs and online listings all look so lush and delicious—who’d think there are so many things to decide? When in doubt, Google your variety, with the words “pollinating partner.” Another fun feature, in today’s nurseries, is that they sell grafted dwarf varieties that solve the pollination issue for you. I used to think this was a gimmick—but it works well for the backyard gardener, and it has the added novelty of producing multiple types of fruit on a single tree. Taking the time to pick the right tree(s) is more than half the battle, in growing happy fruit. We have a lot of space, and we’ve decided to grow four kinds of fruit trees: apples, pears, cherries and plums (and, probably a hazelnut hedge/windbreak, down the road.) We want them for eating, baking, canning and dehydrating, which we’ve taken into consideration in the types selected. Although there are some heirlooms in our picks, we also have some new, more disease-resistant cultivars in the mix, and we have researched the compatibility of our choices for their pollination partners. We’ve picked a total of fifteen trees—which is a lot for most, but we’ll have local, market outlets for any excess. We’ve even chosen varieties that spread our anticipated harvests throughout the season, so we aren’t overwhelmed at any given time with too much fruit. Now, we just have to wait for them to arrive (after all, the ground is still frozen solid.) Then there’s planting, watering, pruning and worrying, and then waiting again—several years—until we have fruit. Of course, there’s the easy way. Just go to the farmer’s market (if you’re lucky enough to have one) for fresh and delicious fare, from your area.